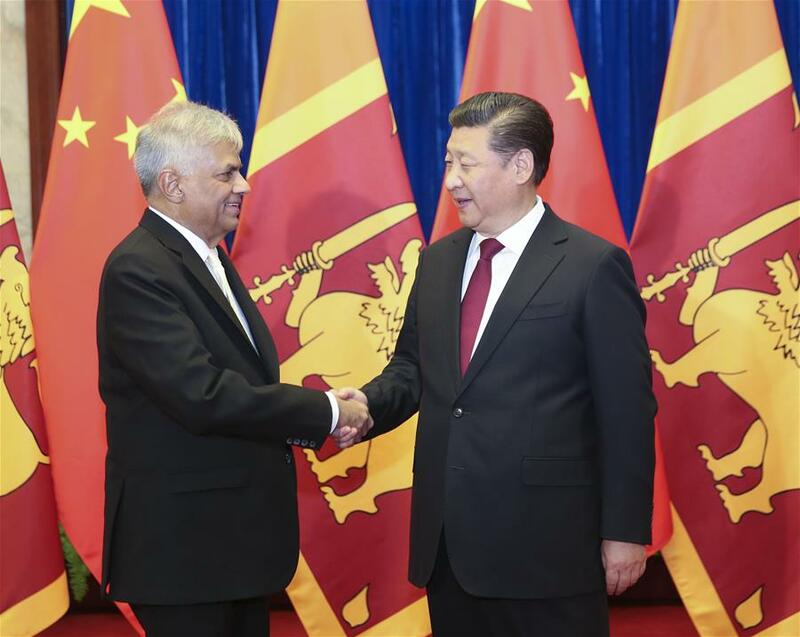 Prime Minister Ranil Wickremesinghe’s visit to China took place at a crucial point in our history. It is very important as it is his first visit since he became the Prime Minister in a two party government after defeating the Mahinda Rajapaksa administration which was a close China ally. Their Chinese connections were high and close enough to cause much trepidation and suspicion in neighbouring India’s corridors of power. Despite Sri Lanka’s good relations with both countries as a non-aligned nation in the past, its relations with both India and the west became sour as China emerged dominant in Sri Lanka’s economic landscape. There were allegations that previous government’s over dependence on China was a great disadvantage to the country when it came to negotiating economic deals with them. So much so there was a great amount of controversy over the terms of massive Chinese loans obtained for building ports, airports and highways and Ranil wickremesinghe as the then opposition leader and his fellow party stalwarts were often critical of these Chinese loans. They were often talking about other possible sources of funding such as the West and the multi-lateral financial institutions that we should have thought of instead of solely depending on China. And they often blamed the Rajapaksa’s for this predicament as they had failed to manage good relations with other countries. However, the irony is that even after defeating that government a little over a year ago Sri Lanka has not been able to attract any significant investments or economic aid from any of those other sources. The only option as widely seen in the last few weeks was renegotiating with China itself as only they had the money and the will to invest here as a part of their future economic vision involving the modern maritime silk route on which Sri Lanka is a strategic point. The bitter truth is that elsewhere in the globe economies are not doing well and there is a general slowdown resulting in lessor demand for oil pushing down international oil prices which in turn has resulted in lessor demand for our exports to some of those oil rich countries. However, the positive side is that the two party government led by Maithripala Sirisena has up to now been successful in maintaining and balancing its relations well with both China and India. On the other hand they have also had good relations with the West and as such will have the future challenge of balancing its relations with India, China, the US, the EU as well as other economically powerful countries in Asia. The reality is that China with its huge investment potential is most likely to become our lead economic partner in the years to come. And balancing relations with India and the rest of the world against the Chinese factor will also be the key to our economic success and it would be a daunting task as well. Perhaps only a joint government of the two main political parties that will be most suited to handle such a sensitive matter. General consensus and openness as far as possible would be a key to success in all such economic and investment matters in the future.